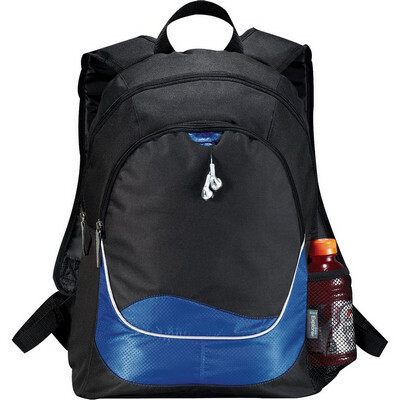 Description: Zippered main compartment. Front zippered pocket with earbud port. Side mesh pocket. Reflective zipper pulls. Padded back panel. Adjustable, padded backpack straps. Drink bottle and earbuds not included. Available in 2 colours. Features: Made from 600D polycanvas in blue and black. No business card holder featured. Packaging: Polybag Colour: Blue with white trim. Material: Polycanvas Product Size: 457mm(h) x 317mm(w) x 152mm(d) Freight details : 30 per carton, 9.6kgs, 48 x 41 x 45cms; Decoration Type(s): Colour Print / Embroider / Full Colour Print Decoration Area: Screen: 120mm(h) x 120mm(w). Embroidery: Centred on front pocket: 150mm Dia. Other Methods: Contact your decorator for applicability and size.